The warm days are almost to an end, and cooler weather is right around the corner. That shift in temperatures means different things to different people, but for those who are fashion minded, it only means one thing: it’s time to pull out the hats. And this year, the beanie hat is the trendsetting fashion accessory that both men and women are most excited about. A beanie hat, also called a skull cap or ski hat, is a soft and stretchable hat that fits snugly over your head to create not only a barrier to wind and cold, but also a cool look that today’s fasionistas love to sport. The most popular color is black because it goes with almost anything. If you want to add beanie hats to your fall and winter wardrobe, here are six cool ways to hear the caps. If you’re trying to make a statement that you’re cool, this is the look for you. To wear this style, you should push the beanie toward the back of your head, rolling the edges, so that your ears are exposed. It will sit on the crown of your head in a relaxed and hip manner. To wear this ultra-cool look, push the beanie toward the front of your head as much as you can, keeping the beanie positioned above your ears. Make sure the top is rounded and sits high. 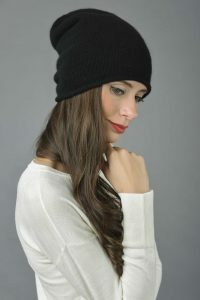 Wear your beanie in an unusual way by leaving the front half of it uncuffed, and then starting at the end of each ear, cuffing it along the back. Pull in down as much as possible before cuffing it so none of the cap sticks up. You want a smooth finish for this one. If you want to stick to the classic look, simply pull the beanie cap over your head and down around your ears. The front should sit just above your eyebrows, and the cap should not cuffed in the front or back. If you want to look casual but cool, this might be the right look for you. To wear it, pull the cap down over your head and create a single cuff all the way around. The hat should come down to the middle of your ears and sit high on your forehead. If you want to present as cool but without effort, wear the beanie as far back on your head as possible, but leave the top of the cap hanging down in a “slouching” manner. This look is perfect for skateboarders, school, and other very casual settings. Beanie caps are the rage this year, but you don’t have to pay a lot of money for them. In fact, at some Amazon stores, you can find black beanie caps for under $10!